A gold bell, 1 cm in diameter, with curved markings was discovered during wet-sifting of material from the drainage channel below the Herodian street near Robinson’s Arch. This is indeed a rare find. According to the press release “The bell looked as if it was sewn on the garment worn by a man of high authority in Jerusalem at the end of the Second Temple period.” Not a regular item of jewelry. The only reference to golden bells in the Bible are bells on the vestments of the high priest (Exodus 28:33-34; 39:25-26). And beneath upon the hem of it you shall make pomegranates of tekhelet and argaman (purple) and of scarlet, round about its hem and bells of gold between them round about. Now you can hear the gold bell “tinkle” in this short video. Jim Davila of the PaleoJudaica blog suggests that the women of Jerusalem wore bangles on their ankles which “tinkled” and had lots of jewelry (based on Isaiah 3:16-23). It seems plausible that they might well have worn bells as jewelry and that some of those bells might have been made of gold. It appears to have a seam on the right hand side so this is my best guess or at least how I would do it using first century methods: First the bell’s maker formed 2 hemispheres using a rounded bit of (cow?) horn or antler and a wooden mallet to drive the metal into a depression in a piece of wood. Each hemisphere would then be filled with either pitch (conifer sap mixed with dried powdered clay or perhaps beeswax (to hold its shape). The surface decoration was probably done with a bronze tool shaped like a very dull cold chisel and driven using a mallet similar to but smaller than the one used to hammer on the horn tool. The completed parts and a bit of gold wire (drawn or more likely hammered) could then be welded together in a tiny charcoal forge with a blow pipe to raise the temperature locally at the seam. This reminds me of another rare find discovered in the excavations in the Givati parking lot across from Ir David, south of the Old City Walls. 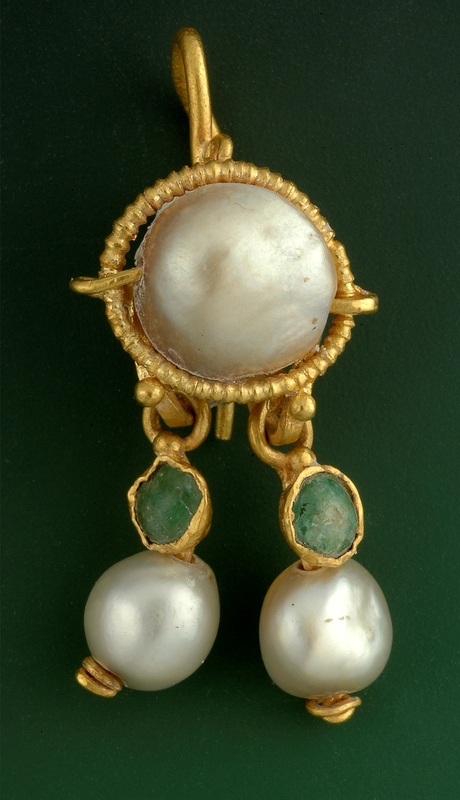 One gold earring was found, made up of a large pearl inlaid at the top center and surrounded by a coiled gold hoop. Two pendants hang below the focal pearl, each one with an emerald in a gold frame and a strung pearl. The earring was discovered in the ruins of a building that dates to the Byzantine period (4th-5th Centuries AD), but archaeologists at the site believe it is much older and that it was created during the Roman period, about 2,000 years ago. This entry was posted in Archaeology, Art, Jerusalem and tagged earring, jewelry, postaweek2011, wet-sifting on July 27, 2011 by Shmuel Browns. You can buy a replica of the gold earring at the City of David gift shop; they also have a really nice rendition of David’s ‘harp’ as a necklace.